We share the letter that the past pupils of Cambodia have written to Mother General on the occasion of the Mary Help of Christians' feast. We, Past Pupils of Don Bosco Vocational Training Center for Girls in Toul Kork, Teuk Thla and Battambang are very grateful to Salesian family for their appreciation, love, and care for us from the first step that we entered the school until now. Through our two years of study here, this school not only provided us the knowledge from text books but also real life experiences. From the last past pupil’s gathering, we have shared and learnt a lot from each other. One of the agendas was to discuss about our feeling with the presence of Mary and how she has helped cure our heart. It was a fruitful discussion as each and every one of us was feeling very proud to have known and be part of Mary’s life. We have become a new person with strong self-esteem, strong inter personal skill, and strong will with kind heart. My name is Pisey Hem and I’m 30 years old. I work with Salesian family for almost 9 years now as a teacher in Tuol Kork, Vocational training Center for girls. I am writing this to express about my feeling about the presence of Mary in my life. I cannot describe it exactly but I can share you my real life story. When my mom passed away in 2001, I felt very sad in life, found no way to be out, spent no time with others, and just hiding in the darkest place. How can I stand with this bad situation? Many questions came out to me and I didn’t think that I had the strength to stand up; even though I had. From the first step into Don Bosco, I am quite unique. Mary shows me the way how to face with many kinds of bad and good situations by accepting ourselves and move forward with peace. Another bad situation is with my aunt’s family. My cousin moved to live in California and we kept contacting every week but later on we lost his contact a few months so my aunt was really worried about him. She asked me for help to contact with the US Embassy about that problem but it seemed not so easy to fix it. So I started to pray for the first time in the Chapel at Tuol Kork to ask from Mary and cried a lot with her if she shows me a miracle I will accept her presence. Then the next day, what I got was my cousin’s email. It was so exciting for me. The reason was that he got an accident and just got better and contacted me. So I went back again to the chapel in order to thank Mary from my grateful heart. From that time I remember ever in my life whenever I am down or in troubles, I always talk with her. She is my best friend ever. Form Pisey’s explanation above, it shows that the miracle really takes place whenever we keep believing and praying to Mary. Another message from our past pupil, Ms. Reoun Sokret: I feel very happy to have known Mary. I have lived my life with full of happiness, braveness, confidence, hard work, the strength to face challenges and problems and love myself and others. Every day and time, before leaving home, I always pray to Mary to grant me safety and I do receive her blessing. I got blessed by her. Mary is like our second mother. She has helped and cured our heart through our praying and talking to her in our mind, thought, and acts. If we have serious troubles which we cannot solve by ourselves or we are not sure of what to do, we can pray to Mary to show us the way and she will show us the way. The above messages are expressed on behalf of our group of past pupils. We are a group of about 1000 people now and we are continuing our doing our best to support the mission of the Salesian Family. Recently, we have come up with new initiative and arranged to have a group of leaders for each batch. Each leader will bring the love and care to all past pupils and ensure that each group will continue supporting Salesian family from their best. Experience from Battambang teachers : 10 years ago I was staying with the Salesian sisters school. One night when we were coming back from English lesson school with my friend we felt that there is someone riding motor behind us. So it made us very scare and don’t know what to do. 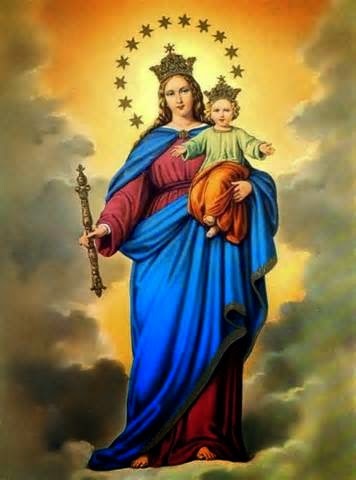 My friend was a catholic and she told me don’t worry about it so much, we must pray to Mary, mother of God, she will listen and will help us from this problem. So we rode the bicycle with scare, but we were still praying with much faith to Mary. When we arrived infront of pagoda, sudenlly we saw one woman riding motor and so this gave us courage and we were very happy. Then we countinued following that woman. When we looked back and saw the motor of who were following us was broken. This gave us big comfort and we felt free and rode bicycle easy to come to school of the sister. When we arrived the conner to the sister’s we did not see woman anymore. At that time we knew that it was Mother Mary who was following and accompanying us with her loving care. From that time we believe that Mother Mary is always with us especially when we have problem and listen to us. - One day my father, who was big gift for our family got very sick. He was so sick that that we have to take him to hospital and he was in ICU. There was no hope of his life. We had no money to pay for his medicine and so I don’t know what to do and where to go to get money. I was crying more and more. I started praying to Mother Mary to help my father get well soon. I was sitting outside and praying to Mother Mary. That time I felt that some one like my mother is standing next to me and consoling me and speaking with me words of comfort. She told me don’t worry..your father is well,he is not sick. This made me feel happy and gave lot of strength and power. After doctor came and told that my father is ok..no problem with his health. From that time I felt that Mother Mary had listen to my prayer and has healed my father giving him new life and hope. I believe that mother Mary was siting next to me and giving me courage to face this problem. I thanked Mother Mary.